The Bloedel Conservatory is the lush, domed tropical paradise at the top of Queen Elizabeth Park — the highest point in the city of Vancouver. In 2009, the city approved a new management approach to the Conservatory. Building on the success of its collaboration at the VanDusen Botanical Garden, the City of Vancouver Board of Parks and Recreation and the Vancouver Botanical Gardens Association entered into a joint-operating agreement for the Conservatory. Bloedel Conservatory has a new roof to ensure visitors are comfortable and safe. This large and complex project replaced all 1,400 acrylic panels of the conservatory’s iconic domed roof over seven months in 2014. This was a large and unique project as the dome structure has more than 1,400 individual “bubble” panels of 32 different sizes. While the conservatory roof was strong, the original roof was more than 40 years old. Some individual roof panels needed to be replaced because they had cracked and were leaking. The replacement of the roof was a multi-phase process. Scaffolding covered the entire dome, as shown in the cross-section diagram. Due to the unique structure, special scaffolding was used to cover – but not touch – the dome. A protective cover wrapped around the scaffolding. Phase one was completed in spring 2014. The remainder of the roof project, or Phase two, was completed by late summer 2014. Special care and attention was paid to protecting the conservatory’s beautiful birds, exotic plants, and visitors during construction. Protective netting was used inside the dome to ensure no birds escaped and no outside birds could enter, and to catch any falling debris. In 1966, while Canada prepared for its Centennial celebrations, two men in Vancouver had a grand vision. Stuart Lefeaux, Superintendent of the Vancouver Board of Parks and Recreation, and Deputy Superintendent Bill Livingstone wanted to do something that would enhance the image of Vancouver. Their vision was to build a Conservatory for exotic plants that would not only be educational, but would also be a beautiful place to visit. They approached Prentice Bloedel, of Macmillan Bloedel Limited, who put forward $1.4 million, in conjunction with contributions by the City of Vancouver and the Provincial Government, to build the Bloedel Conservatory, the fountains and the surrounding plaza. This was the largest civic gift given to Vancouver to date. The elements for the triodetic dome frame were manufactured in Ottawa and shipped 3,000 miles across the country to Queen Elizabeth Park. Once it arrived, the aluminum framework was erected in just 10 days although the entire Conservatory structure took over 1 year to complete. With unerring guidance by Charles Coupar, Bloedel’s first Garden Director, Stuart Lefeaux, Bill Livingston and Prentice Bloedel, the Grand Opening of the Conservatory took place on December 6, 1969 and hosted over 500,000 people in its first year of operation. The Bloedel Conservatory is unique in that it contains three separate climatic zones under one roof: Tropical, Subtropical and Desert. It is home to more than 500 varieties of plants from around the world as well as more than 100 free-flying exotic birds. The Conservatory dome structure consists of 2,324 pieces of 5-inch diameter extruded aluminum tubing and 1,490 plexiglass bubbles set in aluminum glazing. It measures 140 feet in diameter, 70 feet high and covers 16,386 square feet (nearly ¼ acre) of display area. The Bloedel Conservatory was the first large triodetic dome conservatory in Canada and remains this country’s largest single-structure conservatory. It sits at the geographic centre and the highest point in the city of Vancouver. It has been awarded the first Vincent Massey Award for Excellence in Urban Environment (1971) and was designated as a City of Vancouver “Class-A” Heritage building in 1996. Prentice Bloedel and his wife Virginia were also widely known as avid art collectors. Not only did they contribute the majority of funding to build the Bloedel Conservatory and the surrounding plaza, they also gifted the striking Henry Moore bronze sculpture, Knife Edge – Two Piece. This sculpture can be seen next to the fountain in the Conservatory plaza. Moore created the sculpture in 1962, and authorized three castings of the work. The first stands on John D, Rockefeller’s New York estate; the second stands outside the Palace of Westminster, London, England; the third Knife Edge was the first non-commemorative sculpture accepted by the Vancouver Park Board. 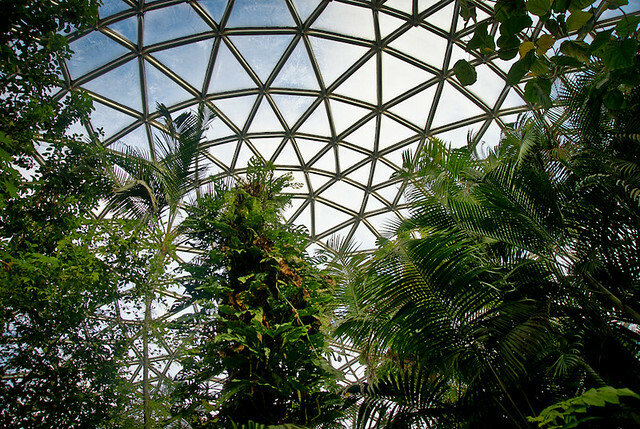 The Bloedel Conservatory is home to more than 500 species of plants from around the world and boasts impressive collections of fig trees, palms, exotic fruit and spice trees, cacti and tropical flowers/ornamentals. The Bloedel Conservatory is home to a resident population of more than 100 free-flying birds. Timbrado and Roller Canaries add their lovely singing to the exotic calls of the Turaco, the Rosella parrot, the Laughing Thrush and a myriad of other birds to create a special magical ambiance under the dome. A variety of macaws and parrots, including Green-winged, Hahn’s Dwarf and Blue and Gold Macaws; African, Amazon, Eastern Rosella, and Eclectus parrots and a Sulphur Crested Cockatoo will say ‘hello’ and entertain with their antics. Also not to be missed are the brightly coloured fantastic pheasants who will delight visitors of any age. Plus a multitude of exotic finches, waxbills, canaries.